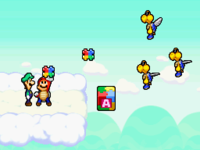 The Koopa Paratroopa Trio is a group of three blue-shelled Koopa Paratroopas in Mario & Luigi: Bowser's Inside Story. Mario and Luigi first encounter the trio after they hit the giant Shell Block. After some quick arguing, the leader of the Koopa Paratroopa Trio silences them and tells Mario that the blue shell fits him nicely. The leader teaches the Mario Bros. how to use the power-up with a training exercise. After completing the exercise, the Mario Bros. are awarded all ten Toad Town Attack Pieces for Yoo Who Cannon. The Mario Bros. encounter the Koopa Paratroopa Trio again in the lower eastern portion of Peach's Castle Grounds. Mario and Luigi hit an Attack Piece Block which contained seven Attack Pieces. As a result, the trio flies over and argues about who the Attack Pieces belong to. The leader of the Koopa Paratroopa Trio then decides to settle the argument with a payment of 30 coins. When Mario and Luigi reply that 30 coins is not much, the leader raises the fee to 300 coins. The other two Koopa Paratroopa Trio get stunned at the high amount. The leader then compensates for the high fee by telling the Mario Bros. where the remaining three Attack Pieces are and circles the locations on the map. The leader also hints that the Attack Piece Blocks are invisible. The Koopa Paratroopa Trio make their last appearance in the game when Dark Bowser has released the dark wind over the Mushroom Kingdom, where they are stuck in a bubble, along with every other citizen. The Koopa Paratroopa Trio reappear in Mario & Luigi: Bowser's Inside Story + Bowser Jr.'s Journey, where they are also battled in the Bowser Jr.'s Journey mode. They briefly attack Bowser Jr., and even imply that by defeating him, they might have leverage over Bowser himself. However, after he beats them, they inform him of where Larry and Lemmy were located, and as they leave, ponder when the time to rescue Bowser Jr. will be. They later appear afterwards where they try to take a picture of them ambushing Bowser Jr. and Roy (who were laying around out of boredom) as proof to Fawful only to be reminded that Mario and Luigi had long defeated him, and then proceeded to fight them out of pride. After they are defeated, they join Bowser Jr.'s troop as allies. Bowser Jr.'s Journey bio: Three Koopa Paratroopa brothers who live for each other and their duty. No one stands a chance against their perfectly syncopated brotherly blows! The Koopa Paratroopa Trio members heavily resemble Shady Paratroopas from Paper Mario: The Thousand-Year Door. Based on their speech mannerisms (i.e. saying "you lot", pronouncing "you" as "ya" and removing certain letters from words) they appear to speak with British accents (most likely the Cockney dialect). This page was last edited on April 14, 2019, at 14:04.